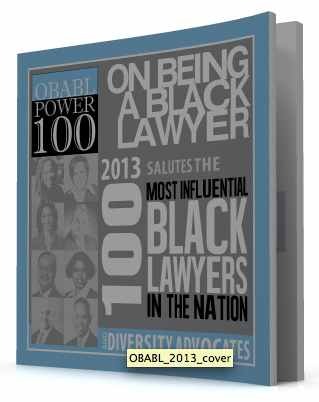 This entry was posted in Publications, Top Stories and tagged Alex Shumate - Squire Sanders & Dempsey LLP, Anthony Pierce - Akin Gump Strauss Hauer & Feld LLP, Ava Lias-Booker - McGuireWoods LLP, Bakari Brock - Twitter, Bart Williams - Munger, Benjamin Crump - Parks & Crump, Benjamin F. Wilson - Beveridge & Diamond, Billy Hunter - National Basketball Players Association (NBPA), Brett J. Hart - United, Bridget M. Healy - ING U.S., Bruce Jacob - Stetson Univ. College of Law, Bryant Cameron Webb - Loyola University School of Law/Wake Forest University School of Medicine, C. Michael Carter - Dole Food Co Inc., Cassandra Ogden - Council on Legal Education Opportunity (CLEO), Charles Ogletree - Harvard Law School, Clarence Otis Jr. - Darden Restaurants, Dan Neff - Wachtell, David C. Drummond - Google, David Lat - Above The Law, David Sanders - Foley & Lardner LLP, Dean Athornia Steele - The Shepard Broad Law Center, Dean Blake Morant - Wake Forest School of Law, Dean Camille A. Nelson - Suffolk University Law School, Dean Christopher Edley, Dean Craig M. Boise - Cleveland-Marshall College of Law, Dean Dannye Holley - Thurgood Marshall School of Law, Dean David A. Brennen - University of Kentucky College of Law, Dean Denise Spriggs - Charlotte School of Law, Dean Donald M. Lewis - Hamline Law School, Dean Freddie Pitcher - Southern University Law Center, Dean Frederic White - Texas Wesleyan University, Dean George R. Johnson Jr - Elon University School of Law, Dean Joanne Epps - Beasley School of Law Temple Law School, Dean LeRoy Pernell - Florida A&M Law School, Dean Linda Ammons - Widener Law, Dean Makau W. Mutua - SUNY Buffalo Law School, Dean Mark Niles - Seattle University School of Law, Dean Okianer Christian Dark - Howard University School of Law, Dean Penelope Andrews - Albany Law School, Dean Phoebe A. Haddon - University of Maryland School of Law, Dean Phyliss Craig-Taylor - North Carolina Central University School of Law, Dean Vincent Rougeau - Boston College Law School, Dean Willajeanne McLean - University of Connecticut School of Law, Debo P. Adegbile - NAACP Legal Defense and Educational Fund, Debra Lee - BET Networks, DeMaurice Smith - National Football League Players Association, Demetris Cheatham - National Bar Association, Don Liu - Xerox Corporation, Douglas L. Williams - Limited Brands, E. Christopher Johnson - The Thomas M. Cooley Law School, Elizabeth D. Moore - Con Edison, Eric Holder - U.S. Department of Justice, Eva Paterson - Equal Justice Society, Farabow, Frank A. DeCosta III Ph.D. - Finnegan, Garrett & Dunner, Ginene Lewis - Honorable Judge Patrice Tucker, Governor Deval Patrick - The Commonwealth of Massachusetts, Gwenn L. Carr - MetLife, Henderson, Henry Freedman - National Center for Law and Economic Justice, Hinton J. Lucas - Dupont, Inc., Inc. (Retired) Albert O. Cornelison - Halliburton, Ivy Thomas McKinney - Xerox, Jacqueline A. Berrien - U.S. Equal Employment Opportunity Commission (EEOC), James M. Rosenbaum - James M. Rosenbaum, James R. Jenkins - Deere & Company, James T. Breedlove - Praxair, Janine M. Landow-Esser - Quarles & Brady LLP, Jaret Davis - Greenberg Traurig, Jeh Johnson - Department of Defense, John E. Page - National Bar Association/Golden State Foods, John Lovi - Steptoe & Johnson LLP, John W. Daniels Jr. - Quarles & Brady LLP, Jomaire Crawford - Quinn Emanuel, Jordan Thomas - Labaton Sucharow, Joseph Beck - Kilpatrick Townsend, Joseph West - Minority Corporate Counsel Association, Jr. - Arnold & Porter LLP, Jr. - New York State Bar/Legal Aid, Jr. - TIAA-CREF, Jr. - UC Berkeley School of Law, Judy Smith - Smith & Company, Karl Racine - Venable LLP, Kendra Brown - National Black Law Students Association, Kenneth C. Frazier – Merck & Co.Kenneth Chenault – American Express Co., Kenneth Imo - WilmerHale, Kenneth Mack - Harvard Law School, Kim K.W. Rucker - Kraft Foods, Kim Keenan - NAACP National Office, L. Londell McMillan - The North Star Group, Larry D. Thompson - PepsiCo, Laura Neebling - Perkins Coie LLP, Laurie Robinson - CCWC/CBS Corporation, Leondra Kruger - US Department of Justice, Lindsey & Africa, Lipton, LLP, LLP Robert Brager - Beveridge & Diamond, Lois Kimbol - Philadelphia Diversity Law Group, Marc Morial - National Urban League, Martiné "Marty" R. Dunn - Dinsmore, Maurice A. Watson - Husch Blackwell LLP, Max Siegel - USA Track and Field, Mayor Kasim Reed - City of Atlanta, Michael K. Tucker - Avis Budget Group, P.C., P.C. Norman J. Chachkin - NAACP LDF, Paul Eyre - BakerHostetler, Paul Harris - KeyCorp, Paul Williams - Major, Power 100 2013, Raymond McGuire - Citigroup, Reeves Carter - Miss Jessie's, Reginald A. McGahee - Howard University School of Law, Rhonda R. Mims - ING U.S., Rifkind, Robert Grey - LCDC/Hunton & Williams LLP, Roderick A. Palmore - General Mills, Roger W. Ferguson, Rosen & Katz, Rowan D. Wilson - Cravath, Ryan Smith - Turner, S. Jeanine Conley - Baker Hostetler, Seymour W. James, Sherrilyn Ifill - University of Maryland School of Law/NAACP LDF, Sherry Williams - Halliburton, Sheryl Willert - Williams Kastner, Stacey Mobley - Dickstein Shapiro, Stephen Carter - Yale Law School, Sunny Hostin - CNN, Swaine & Moore LLP, Teri P. McClure - UPS, THE EXECUTIVES Vernon Baker - ArvinMeritor, Theodore V. Wells Jr. - Paul, Theresa Cropper - Perkins Coie, Thomas Sager - DuPont, Tolles & Olson LLP, Tracy L. Rich - Guardian, U.S. District Court for the Eastern District of PA, Valerie D. Lewis - The Executive Leadership Council/Safeway Inc., Veta Richardson - Association of Corporate Counsel, Wanda L. Forrest - Credibility International, Weiss, Wharton & Garrison LLP, William E. Cook, William Harker - Sears, William J. Perlstein - WilmerHale by OBABL Staff. Bookmark the permalink.